Kelvin Thomas has confirmed the money from the sale of Ricky Holmes to Charlton Athletic will be re-invested into the Cobblers squad ahead of the Sky Bet League One campaign. But the Town chairman also says the money is more likely to be spent on bringing in long-term loan players to bolster Rob Page’s squad, rather than the club making a permanent signing of their own. 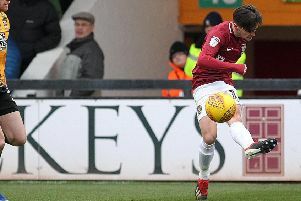 Holmes was sold to the south London club last month for a ‘significant’ undisclosed fee, but the amount has not been confirmed by either the Cobblers or Charlton. Thomas revealed Page has had his playing budget for the new campaign increased due to the sale of Holmes, but says the club has to be careful with how it invests the money. “But we also have to remember, and it’s probably why we’ll look at the loan market to use that, because you have to remember that is only one-year money. “So if you rush in and sign players on two-year deals, you put yourself at risk of having an increased budget next year, based on only money that came in this year. “You have to be careful about that and you have to manage it right, but we have increased the budget to ensure we use the Ricky money, but we are not going to rush into anything. The Cobblers are preparing for their first season in league one since 2009, and Thomas says last year’s title win and promotion means the club is now involved in a whole new ball game when it comes to the financial side of things. But he pledged that everything will be done to make sure the Cobblers are competitive. “I have done the league two thing before, and we are now definitely in a different market-place, and I think it has even moved on quite a bit since I was involved, in terms of salary levels of Championship players,” said the Town chairman. “There is a big difference between league one and the Championship, so if you are looking to bring players out of the Championship there is a disparity in that level. “Even some of these young players at the Premier League and Championship clubs are on a lot of money in comparison, and we are not at that level. “We are not at the level of some of the clubs in our league, and we know that, but we know we are going to compete. And he added: “The reality is we didn’t have the highest budget last season, and look what happened. “We won’t have the highest budget in league one that is for sure. “I spoke to Chris (Wilder) about what is available at Sheffield United, and I know what’s available at Charlton and some of the other bigger clubs.